Whether you are a blogger, office worker, or artist we all need a little creative inspiration from time to time. Maybe you need a kick start for a writing a blog post or help picking out topics for Pinterest. Perhaps you want to plan a dinner party or come up with a fun themed Birthday. Whatever your need it helps to have a jumping off point. For this reason, I came up with this list of Creative Inspiration for March 2016. Do you know what is better than a list?! A pretty list! 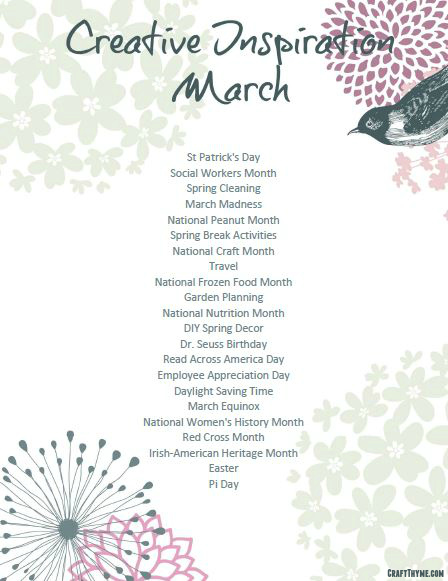 Oh yeah, you also get to learn things like March is National Crafts Month*, Dr. Seuss would have celebrated his 112th birthday, and you better jump on planning that garden. How is this creative inspiration? Maybe you can pin images of garden plans, create a Cat in the Hat lesson plan, or treat yourself to a new craft machine. Hint, hint babe, I may need the Silhouette Mint* to jump start my creativity in March. Spring is a time for newness, and the first of the year. I am always inspired to clean, the house and my website. My domain and host are due this month, so I have been changing things around, looking for a new theme, just having fun with it. It is really getting me in the mode to figure things out, and make things look nice. I really love Dr. Seuss, so I’m digging that this month is his birthday! Oh the places you’ll go! These are great blog inspiration! I’m pinning, stumbling and tweeting this post. Happy Monday! This is a great list and a great idea. Thanks for your inspiration!